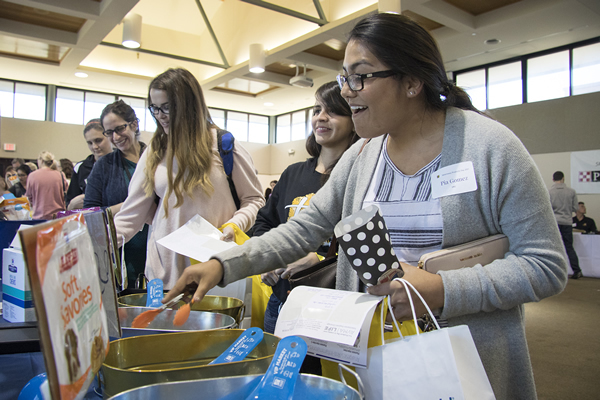 The College of Veterinary Medicine’s Veterinary Products Day brings together students and representatives from animal care and nutrition companies, allowing students to learn about the products the companies make and distribute. 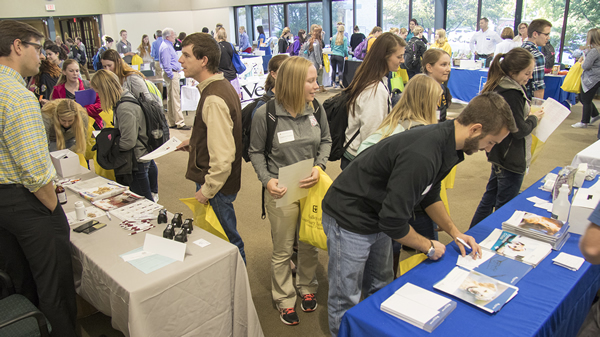 Fourteen companies and agencies participated in the 21st annual MU College of Veterinary Medicine Veterinary Products Day held Oct. 17 in the Adams Conference Center. 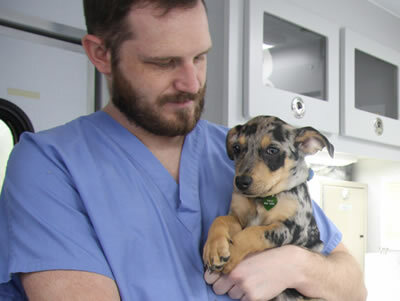 The networking event brings together veterinary students with representatives from animal care and nutrition companies and veterinary interest businesses. The forum allows students to learn about animal nutrition and care products, careers opportunities and professional services. Companies and agencies attending included, Addison Biological Laboratory, AVMA Life, Banfield Pet Hospital, Boehringer Ingelheim Animal Health, Dechra Veterinary Products, Hill’s Pet Nutrition, iVet Professional Formulas, MWI Animal Health, Nestle Purina Pet Care, Norbrook Inc., NutraMax Laboratories, Royal Canin, Virbec, and Zoetis. Second-year veterinary student Pia Gomez picks up some samples of pet treats during the College of Veterinary Medicine’s Veterinary Products Day. The evening included a food buffet featuring a variety of appetizers, as well as drawings for prizes and scholarships. Winning $500 scholarships each were: Sydney Gooch, VM-1, Johanna Klein, VM-2, Stephanie Thole, VM-3, and Brittany Hedrick, VM-4. Other drawings included two $50 gift cards, donated by Norbrook and won by Amber Stewart, VM-1, and Sarah Hencke, VM-1; $30 gift cards, donated by Addison Biological Laboratories and won by Justin Schwarzlose, VM-1, and Kara Fulkerson, VM-1; a set of books, donated by Zoetis and won by Lauren Hamm, VM-3; stethoscopes, donated by AVMA Life and Boehringer Ingelheim Animal Health and won by Chenoa Schwenn, VM-1, Kelly Sandelin, VM-3, and Jordan Weintraub, VM-4; a Yeti tumbler, donated by AVMA Life and won by Jackie Storey, VM-1; gift baskets, donated by Hill’s Pet Nutrition, NutraMax Laboratories and Virbac and won by Alexandra Frost, VM-4, Megan Claxton, VM-1, and Molly Churchill, VM-2; a vest, donated by MWI Animal Health and won by Kelly Sandelin, VM-3; and a variety of additional books, bags of pet food, t-shirts and utility keys.